Kosman and Picciotto in your iPhone or iPad! For decades, crossword solvers had to be content with the humble tools of paper and pencil (or pen, for the more confident). But in recent years, crossword puzzles, like so many other cultural artifacts, have been migrating slowly and unmistakably to more high-tech platforms. A number of programs for desktop and laptop computers have been around for several years, growing steadily in popularity. And more recently still, crosswords have begun making their way into mobile devices. 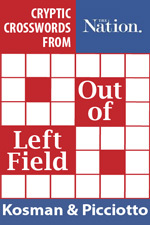 We know this because our first twenty Nation puzzles are now available in an e-book from Puzzazz, titled Out of Left Field: Cryptic Crosswords from The Nation. The free app for solving these is available for iPhone and iPad, and an Android version is coming, we hear. Sequels should appear every six months, so if you like to solve cryptic crosswords on a screen, this is for you. Joshua: I still do a lot of my crossword solving on paper, but I also find myself doing plenty of crosswords at my computer (when I should be working). The most popular platform is a free program called Across Lite, which is flexible enough to accommodate a wide range of puzzles. I do find it hard to take in an entire grid at a glance, but for speed and ease of use it’s pretty hard to beat. Henri: I have been solving crosswords on a mobile device for a long time: I started on Palm, and have now moved on to an iPhone. What is great about this is that the puzzles are always in my pocket. (Of course, that’s also what is problematic about it.) However, on a small touchscreen keyboard, it can be tricky to hit the keys you want. Puzzazz has an answer for this—the app allows you to hand-write your answers on the screen. Another nice feature is that you can set the software to indicate word boundaries in multiword entries. This can be quite helpful when solving a tough clue for a phrase. But the killer feature of the app is the many ways to ask for hints, which almost replicate getting help from a live human being. If a clue is stumping you, you can ask the app what type of clue it is (anagram, reversal, etc. ), and it will tell you. You can also ask to be shown where the break is between wordplay and definition. And you can ask the program to delete any errors you might have entered into the diagram. Those approaches to hinting seem more legitimate to us than having the program fill in a letter or word for you, but that too is available as an option. In addition to the Nation puzzle, Puzzazz offers books of American cryptics by Todd Rew and Mike Selinker, British cryptics by Brian Greer and many other types of puzzles as well. How do you feel about solving on an electronic platform? Please share here, along with any quibbles, questions, kudos or complaints about the current puzzle or any previous puzzle. To comment (and see other readers’ comments), please click on this post’s title and scroll to the bottom of the resulting screen. • A Nation puzzle–solver’s blog, where you can ask for and offer hints, and where every one of our clues is explained in detail.